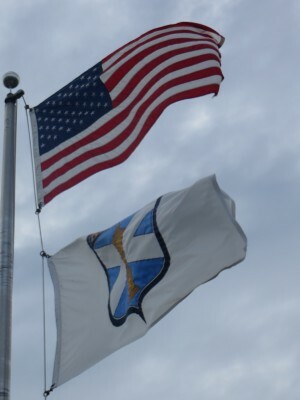 There have been a number of “pure golf” club’s created in the area between Baltimore and Richmond over the last fifteen years-their common thread is creating the complete golf experience not just the course itself. All the facilities-visitor cottages, food service, locker rooms, practice areas, and the course itself-are of high end quality and there is a real emphasis on personalized service to enhance the player’s experience. 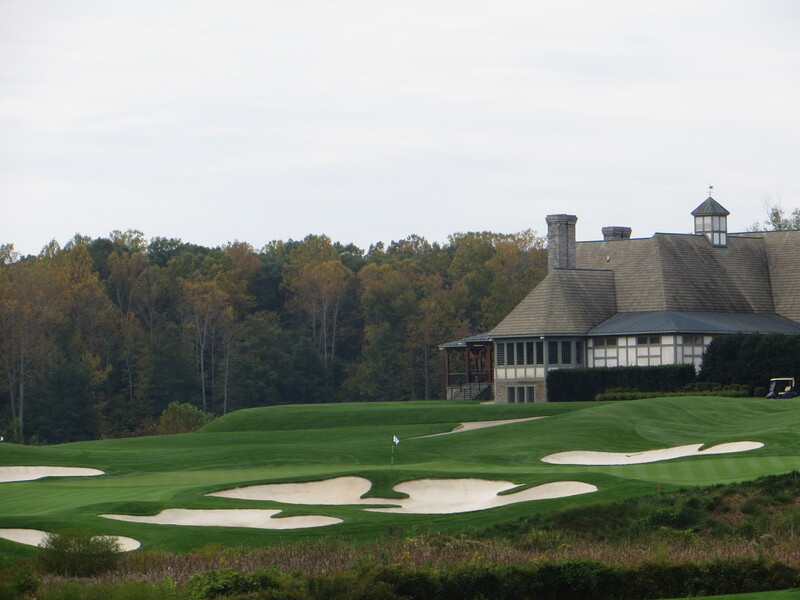 Caves Valley Golf Club, Robert Trent Jones Golf Club, and Four Streams Members Club are all examples of this approach. 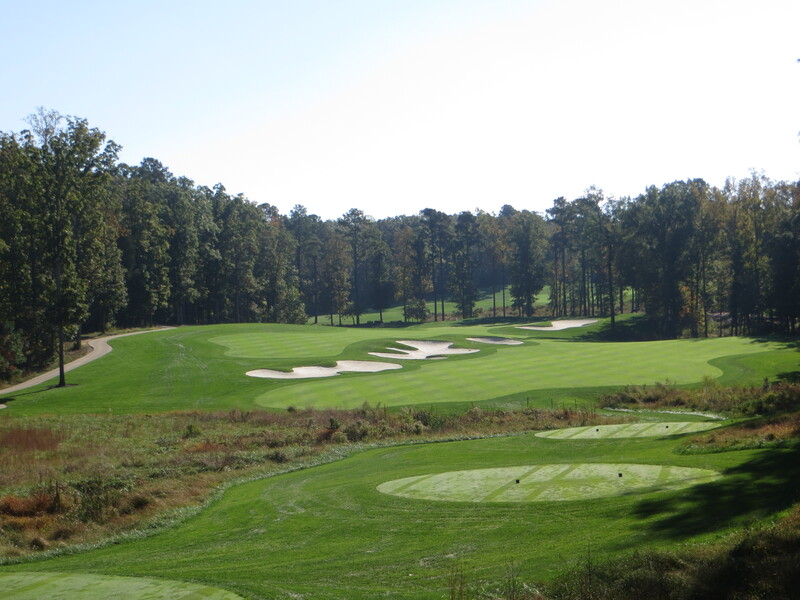 Kinloch Golf Club just outside of Richmond is the latest of these to come on line and they have certainly accomplished their mission of making a place to fit comfortably among their peers. The country style clubhouse dignifies the 9th green with it’s presence. Kinloch is the brain child of C.B. Robertson who originally wanted to create an upscale daily fee facility in a market that he considered underserved with quality golf opportunities. He approached Vinny Giles-a past U.S. Amateur winner from the Virginia area-about doing the design. 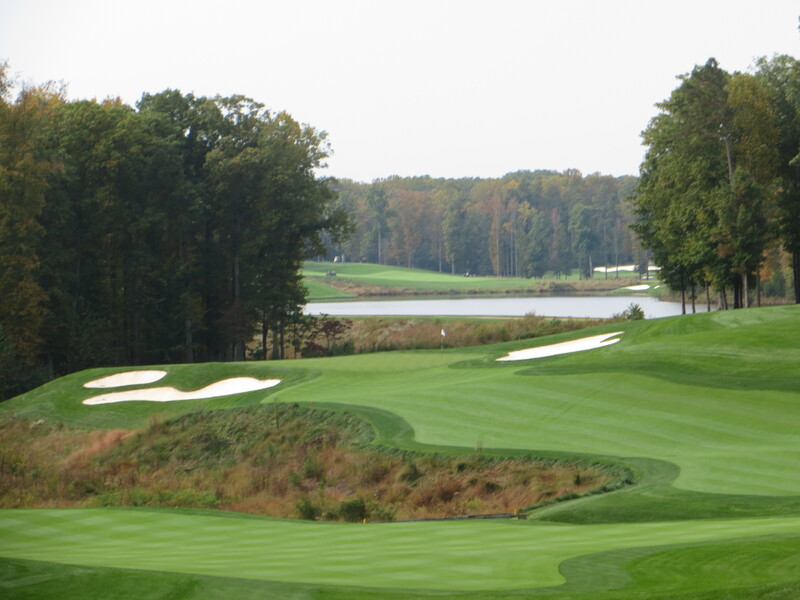 Vinny initially begged off since he had no real experience in course design, but eventually agreed to act as the primary consultant when Robertson hired Lester George who had done considerable new golf course design as well as significant renovations to established top line courses from Delaware to Virginia. 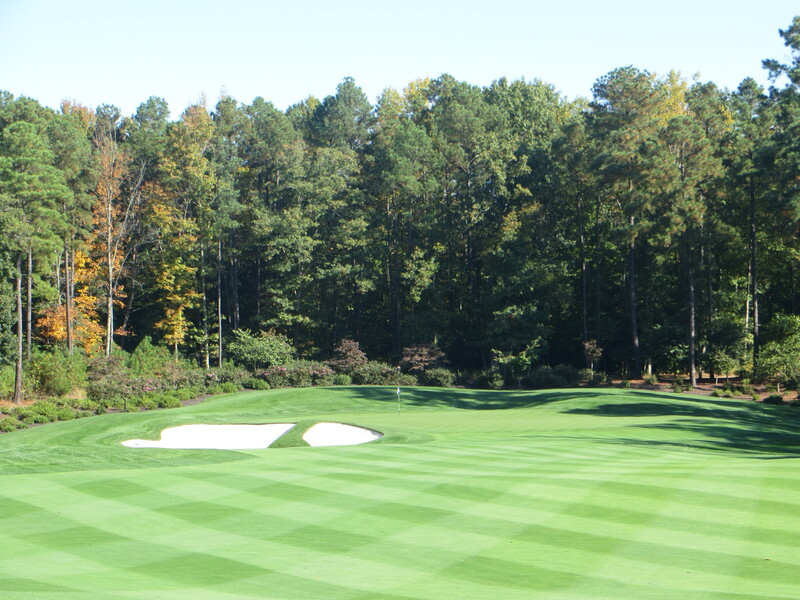 When the team got into the design and routing phase they decided that this piece of land offered a unique opportunity for something really high line and Robertson was convinced to realign his plan from a daily fee facility to an exclusive private golf club. On an autumn day the first green introduces the grand beauty of this property. The results of their collaboration is a very special golf club that very few people will get to experience. With only 300+ members-many of them from outside of the Richmond area-they are playing less than 10,000 rounds a year on this pristine layout. The amenities throughout the facility are top of the line-elegant club house with a very cozy interior layout of the golf shop, locker room, and bar/eating facilities that make the player feel like they are in the comfortable surroundings of a friend’s country estate. 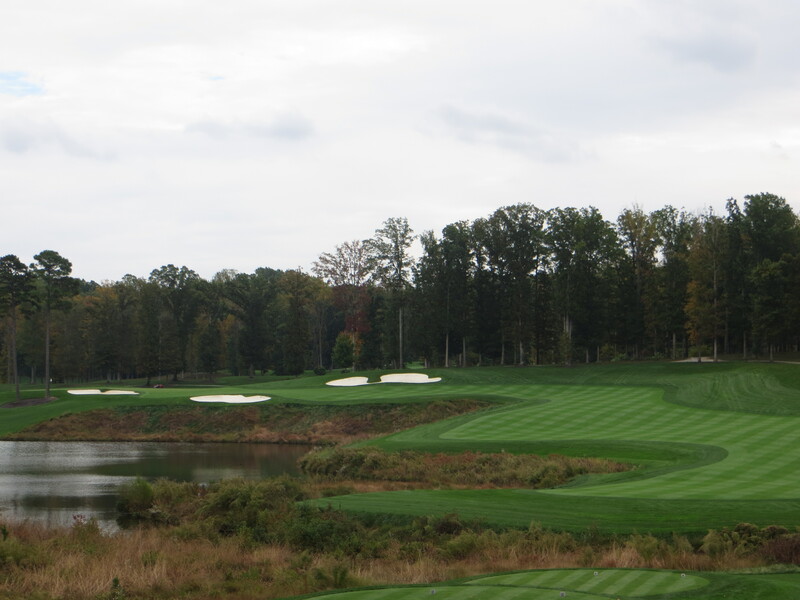 Taking in the challenge off the elevated tee on #2 will make you pause for consideration. The practice facilities are as good as you will see anywhere-acres and acres of driving range, putting greens, chipping greens, and pitching areas that are designed to replicate on-course conditions for effective practice sessions. The target greens on the driving range are cut to course specifications so you are aiming at real targets that respond as the greens would to a well struck shot. The arrangement of the pitching areas allow for shots up to 80 yards and from one spot a player can pitch at multiple targets of different approach configurations which makes shot simulation as real as it can get. The full feature practice facility replicates short game permutations and combinations. The attitude of all of the staff at the club is to make the members and guests feel comfortable and the delivery on this is beyond anyone’s expectation. You just never feel like you are imposing on anyone when you ask for something and you never feel that you are spending your money as you partake in what they have to offer. Pure artistry on display in the composition of the Par 4 6th. This is a walking golf course-a wonderful stroll up and down an expansive rolling piece of woodland that tumbles out in front of you. The absolute minimum of dirt was moved to build this course-they picked natural tee and green settings to build holes that are very dramatic and visual but truly feel like they belong on the terrain. The money they saved in not moving soil they spent in importing grasses from out of the region. The entire course was sodded with bent grasses for fairways and greens and bluegrass for the rough. This is one of the southern most courses using bent grass but the sod took heartily to the region and their maintenance budget has kept it impeccable. 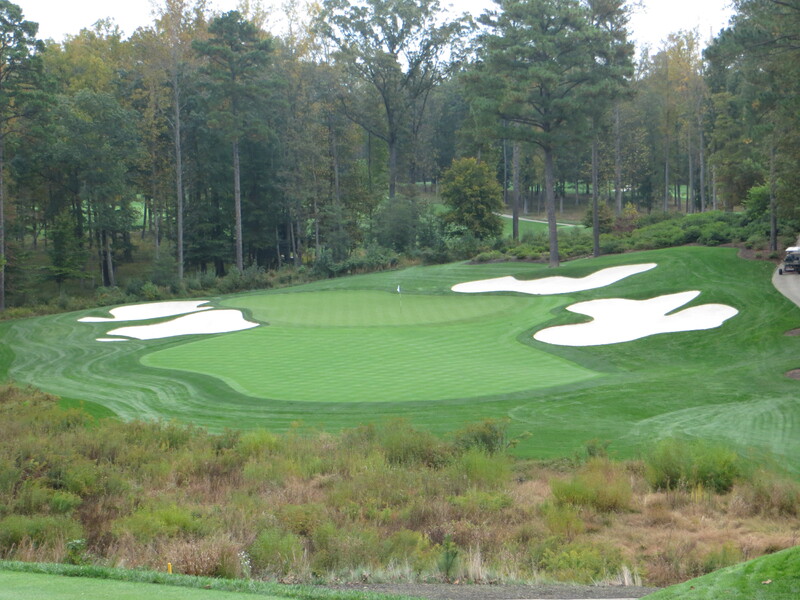 Elevation change and the setback of the trees fill the canvas on the Par 3 7th. The trees have been cleared well off the playing area of the course-Warning: everything looks larger or farther than it really is-there is very little frame of reference for distance or size of target. 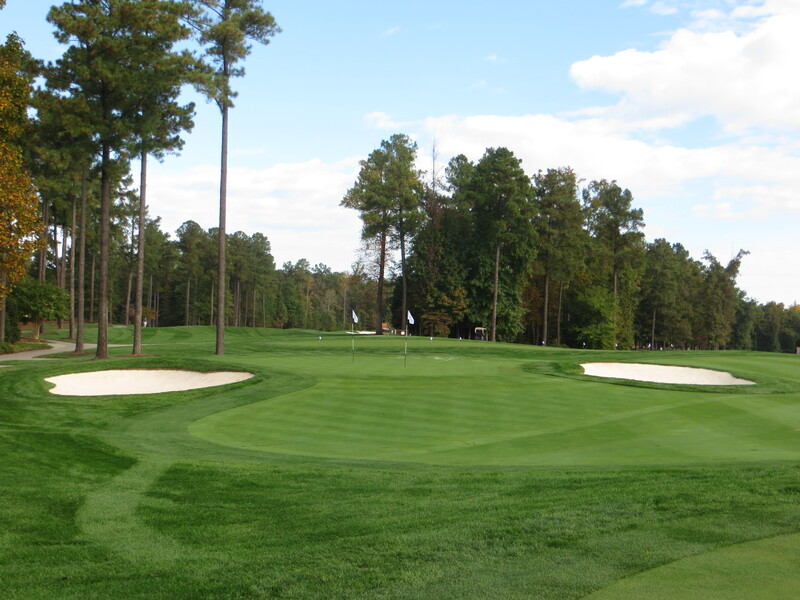 The lack of trees in the playing was compensated for by the use of natural hills and swales, existing environmental areas, and rambling streams to segment landing areas and the give the golfer a wide array of tactical choices in playing the holes. 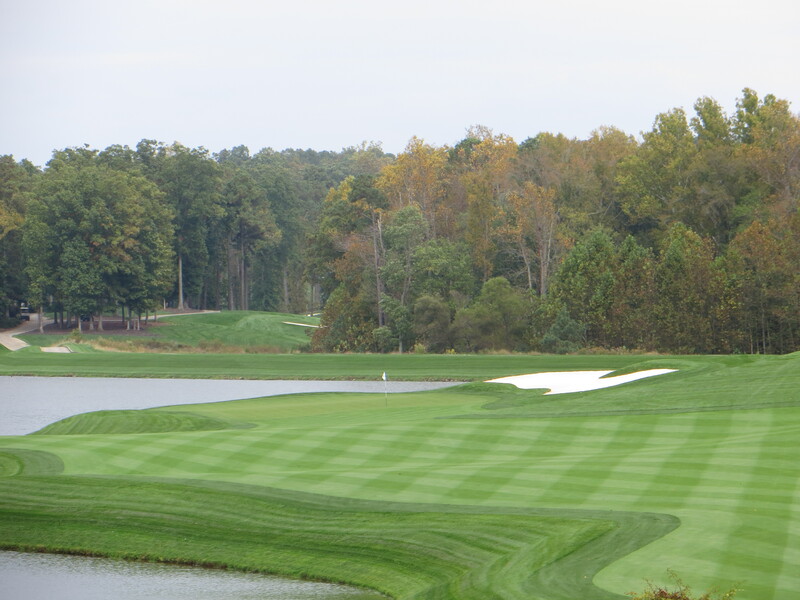 The finishing hole brings the loch into play…in a big way. They even included a playable 19th hole for settling bets. 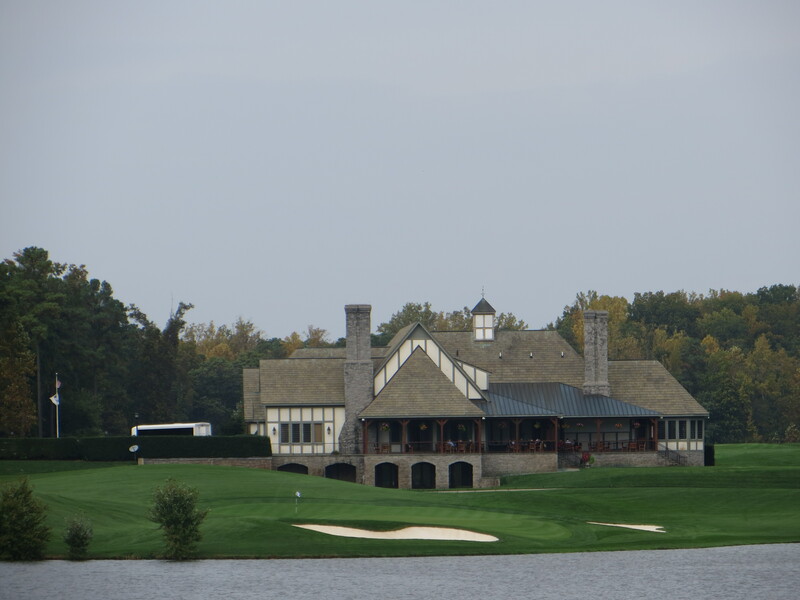 This is a nice 160 yard carry of the lake to a green setting just under the veranda of the clubhouse. You can be sure there will be a vocal audience arbitrating the final stage of your competition. Added bonus of the 19th hole set at the foot of the clubhouse. At the end of a round you will feel mentally exhausted because this course forces you to play with our head as much as your hands to be successful. The result is a very gratifying golfing experience no matter what your score. The majesty of the Par 4 16th will revisit you in bed at night (click image for the full dream). Do not fail to enjoy the bar/lounge next to the locker room. A real Hamish setting for settling the bets and telling big fish stories. I highly recommend the chocolate chip cookies on the bar. of pieces a week so it remains pretty fresh. Thanks for taking the time to share your thoughts, I appreciate your comments.